In 1974, Lap Kadoma — the wife of a Nepalese sherpa — had a close encounter with a Yeti. The legendary cryptid, Kadoma would later recount, had managed to sneak up on her from behind, before heaving her into a river. When Kadoma regained consciousness, she found the bodies of several dead yaks strewn nearby. Kadoma's account of her encounter with a Meh-te, or "man bear," as Yetis are known in Nepal, may sound far-fetched, but reports like hers are not uncommon in the Himalayan regions of Nepal and Tibet, where legends of the mythical creature have been passed down for generations. Far less common, by comparison, is physical evidence for the Yetis' existence. One such specimen, known to curators at the Royal College of Surgeons' Hunterian Museum in London as the "Yeti's finger," was recently re-discovered just a few years ago, when, after being overlooked for close to half a century, the finger was recovered from a box of items donated to the Museum by primatologist and cryptozoology enthusiast, professor William Osman Hill. Perhaps not surprisingly, a DNA analysis recently revealed that the finger, pictured up top, is of human origin. 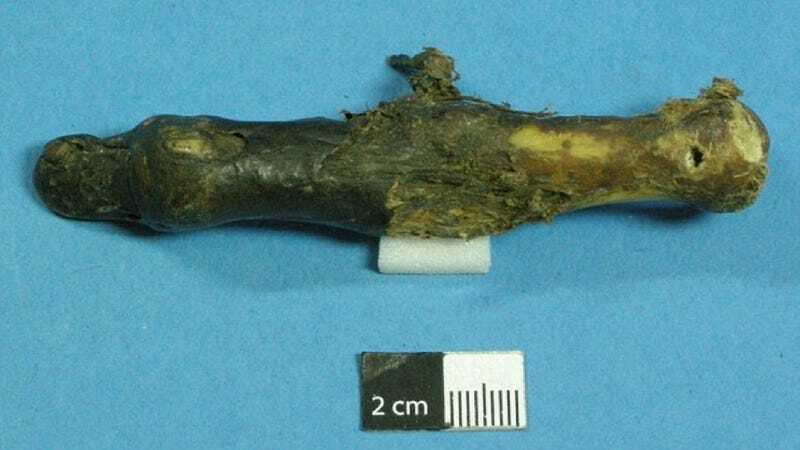 But in the end, the most fascinating thing about the Yeti finger has not been determining whether or not it actually belonged to an iconic cryptid, but how it came to be sequestered in the vaults of the Royal College of Surgeons' museum. "It was labeled 'a Yeti finger from Pangboche hand,'" recalls journalist Matthew Hill, who first encountered the specimen while perusing a collection of human and primate skeletons at the College's Museum. "What was the story behind this finger, I wondered, and how did it end up in London? Where was the rest of the ‘Pangboche hand'? And what truth was there behind the label's claim that this finger belonged to the Yeti of ancient legend?" When Hill first started asking these questions back in 2008, the answers were unknown to all but a few people — none of whom, it so happened, were working at the Museum. But when Hill set out to investigate further, he unravelled a long and winding history that reads better than the latest installment of Indiana Jones — a history with wealthy American oilmen funding Nepalese expeditions to investigate Yetis; a secluded Buddhist Monastery, hidden away in a remote Himalayan mountain range, that once housed not only the Yeti finger, but an entire hand; the disappearance of said hand in the 1990s; and the campaign to find it and return it to the monastery and its monks, who believe that it protects them from bad luck. And no, I did not include a picture of Jimmy Stewart for no reason — it's here because he, too, is implicated in the finger's history. You'll find two great pieces recounting the elaborate backstory of the mysterious Yeti finger (and its associated hand) over at The Daily Mail and BBC News.